Product prices and availability are accurate as of 2019-04-05 07:54:41 EDT and are subject to change. Any price and availability information displayed on http://www.amazon.com/ at the time of purchase will apply to the purchase of this product. Having too big of a clog in your drains to allow liquid to flow down? Don't want to spend tons of money on expensive cleaners or services? Well Katzco has the solution for you with our 3 Piece pipe cleaning brush set! Katzco drain cleaner and clog removing brushes are made of a heavy duty steel coil to ensure there is no breakage, rust and provide some flexibility when being used. Pipe cleaner is built to last through everyday use. Can be stored conveniently under sinks in bathroom and kitchen or anywhere else needed. Katzco pipe cleaners are a quick and safe alternative to using harsh, unsafe and toxic chemicals to unclog drains and pipes. Also less expensive than chemicals! Will also not damage pipes or cavities that are being cleaned. Pipe cleaning brushes are super easy to use. Simply slide down into the drain as far as possible and scrub around to remove debris and build up. Clean brushes and use again! Easy to clean and Fits through many strainers, pipes, and drain controls. These brushes can have many uses inside the home and out. They can be used in industrial work settings to clean pipes and other metals for soldering. Use for plumbing to unclog and clean toilet and bath drains and septic pipes. Use for your kitchen sink if it's clogged and keep everything running smoothly. 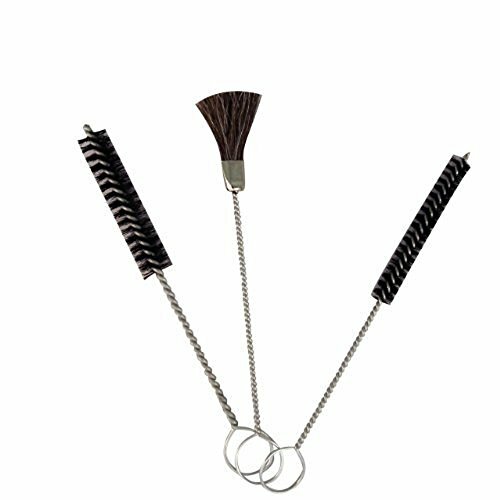 This brush set comes with 3 different types of cleaning brushes in 3 different sizes to accommodate any pipe or cavity cleaning situation you may be confronted with. Comes with: • 1 pc 5/8" Inch diameter brush • 1 pc 3/8" diameter brush • 1 pc ½ Inch diameter brush. Get the best bang for your buck with Katzco products! DURABLE- Katzco drain cleaner and clog removing brushes are made of a heavy duty steel coil to ensure there is no breakage, rust and maximum flexibility when being used. Drain cleaner is built to last through everyday use.